Five people have been confirmed dead and 10 injured as a result of Hurricane Matthew in Haiti, the country’s Office of Civil Protection said today. Spokesman Edgar Celestin said authorities are still compiling an assessment of the storm’s impact, especially in Grand’Anse which remains cut off because of no cellphone service. At least 1,855 homes were flooded, affecting 2,700 families. The number of people who were evacuated and went into shelters rose from 9,000 to 15,623. The storm battered Haiti’s southern peninsula while unleashing heavy rains and winds around the country. Across the country in the northwest, the storm also flooded homes and streets. “Trees have fallen and homes are destroyed. 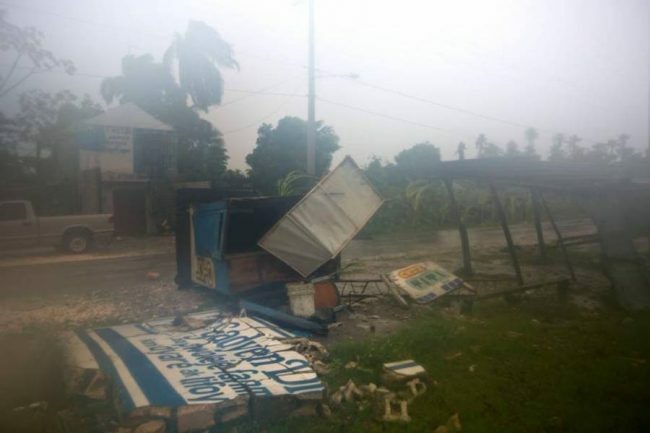 The majority of farms have been leveled,” parliamentarian Jean-Michel Moise had tweeted as the storm passed near the country’s northern coast. The rains and strong winds continued in Bombardopolis this morning as trees continued to fall and rivers rise. The Meteorological Service warned Haitians that the risk of flooding continues even as the weather subsides in some places of the country, like the capital. Fallen trees are seen after Hurricane Matthew passed through Les Cayes, Haiti. Haitians wading through flood waters. Strong winds ripped through Haiti.